The revolver that guy is shooting looks like a S&W 460. If that is a 460 he is lucky he didn't get his nose broken or a concussion. He had what looked like thick cloth with a very poor hand hold. Depending on the load he could have been seriously injured. Some people are idiots. Early in the release of this weapon there has been some serious injuries. There is a video of a kid whose parents bought him one. On his first shot he had two fingers in front of the cylinder. The blow back cut the ends off of those fingers. I tried to find the video but it has been deleted. Why do husbands die before their wives? They want to. My aunt Millie died at my 10th birthday party. It really shook me up. I mean, I still like to have birthday parties, but now I'm a lot more careful about what I wish for. When I finished high school, I wanted to take my graduation money and buy myself a motorcycle, but my mom said no. See, she had a brother who died in a horrible motorcycle accident when he was eighteen, on a bike he had just bought with his graduation money. And I could just have his motorcycle. An 89 year old man was having his annual checkup and the doctor asked him how he was feeling. "I've never been better!" he boasted. "I've got an eighteen year old bride who's pregnant and having my child! What do you think about that?" The doctor considered this for a moment, then said, "Let me tell you a story. I knew a guy who was an avid hunter. He never missed a season. But one day went out in a bit of a hurry and he accidentally grabbed his umbrella instead of his gun. So he was in the woods and suddenly a grizzly bear appeared in front of him! He raised up his umbrella, pointed it at the bear and squeezed the handle. And do you know what happened?" Dumbfounded, the old man replied "No." The doctor continued, "The bear dropped dead in front of him!" "That's impossible!" exclaimed the old man. "Someone else must have shot that bear." The doctor replied "That's kind of what I'm getting at . . ."
Sorry, but that's my motto. When the doctor told me I'd never be able to talk again, I was speechless! What this thread needs is a gif....A vision of OU Chinamans last memory of the Spring Game. 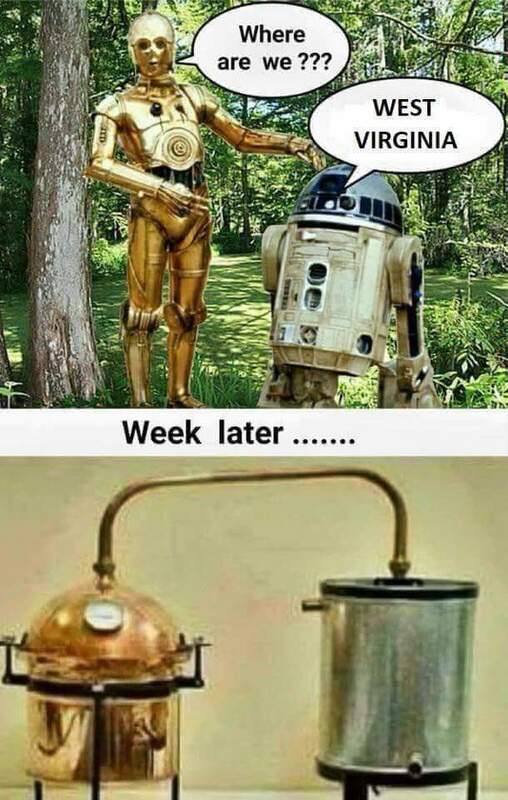 This is why Star Wars was not filmed in West Virginia. I was against organ donation until I was the one who needed the transplant. Then I had a change of heart. Did you hear about the two chimps who shared an Amazon account? I have a Russian friend who’s a sound technician. And a Czech one too. Czech one too. My wife got tired of my constant wordplay jokes, but I told her I didn't know how to stop. “Whatever means necessary” she replied. Humpty Dumpty is having a terrible winter. Which is disappointing, because he had a great fall. Wasn't feeling well earlier, but went ahead and grilled up some hot dogs and brats. My neighbor, who raises birds, smelled them, and said he'd trade me a bird for one of the brats. I said sure. I guess it was a bad idea, because I took a tern for the wurst. I went bald years ago, but I still carry around my favorite old comb. I just can't part with it. Good thing I pointed out a tern ... otherwise you would never have gotten this joke.